When you are taller than the average person, finding a good road bike frame that fits your height can be a bit of a challenge. And a proper fit is of the utmost importance, otherwise you do not get a very comfortable ride. So, if you’re a tall guy or gal, what do you do about this problem? Well, the good news is that they do make road bikes to fit tall riders. The bad news is that a lot of local bike shops don’t actually carry these larger size road bike frames in the store. That means that you pretty much have no choice but to purchase your road bike online. For most tall riders, a size 61 cm (25-inch) or higher is where to start your road bike shopping. Getting a bike that perfectly fits your body is important, so let me first help you to determine how to come up with the perfect size road bike for your height. Assuming that you already know your height, you should measure your inseam. Do this by standing up against a wall with your legs spread apart maybe 6 to 8-inches. Then, take a book with the spine up and slide it up the wall (between your legs) until you feel it firm against the crotch. The book is important because we are substituting it for a bike seat to get a most accurate measurement. At this point, I hope that you have someone else in the room with you, because you need them to measure from the top of the book’s spine down to the floor to get your inseam measurement. **Note that you need to get the measurement in centimeters, not inches (convert inches to centimeters by multiplying inches by 2.54). I think it is also important to point out that when we talk about the size of a bike frame, what we are really discussing is the length of the seat tube. And, that measurement is arrived upon by one of two methods: from the center of the bottom bracket to the top of the top tube (C-T) or from the center of the bottom bracket to the center of the top tube (C-C). Neither is really an industry standard, and different bike companies use different methods to get the frame size. That being said, you’re looking at around 1 to 1.5 cm difference between the two, with the C-C being the shorter one. 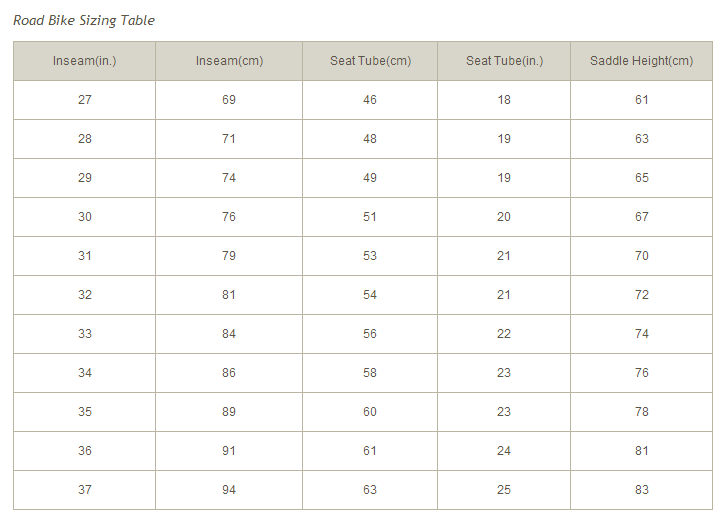 Now that you have your inseam measurement, you can determine the proper seat tube height for your body. So, take that inseam number and multiply it by .67 to get C-T length, or by .65 to get the C-C size. To get your torso length measurement, stay in the inseam measurement position listed above (complete with book in place), and have someone measure from the top of the book’s spine to just above your sternum where the small “v” is at your throat. Take this down in inches, not centimeters. For arm length, take the measurement from your collarbone to the about the center of your palm. It won’t be exact, but close enough for our purposes. Also take this one in inches. Saddle height isn’t really important for getting a good fit on you road bike since it is adjustable. Looking at the table above, tall riders should plan to probably move up a size for comfort. So, if you’re over 6-ft tall, that is something for you to keep in mind. It should come as no surprise that actually finding a road bike with a frame large enough to comfortably fit a tall rider is rather difficult. Most of the bike frames out there top out at 60 cm, which means that people over 6-feet in height have a real hard time when shopping for something that fits. After literally hours of helping out a friend who needed such a bike, I finally managed to find a few models that work for tall men and women. That’s the good news. The bad news is that they mostly have a bit higher price tag than the Giordano Libero (which does go up to a 61 cm frame, if that works for you). For the best results, you are going to want to go with a Trek brand road bike. They make some 62 cm and 64 cm bikes that are not only large enough to accommodate a tall rider, but they are actually really great bikes that give you a really great, smooth ride. Prices range from just over $750 for the Trek 1.1 C to just over $5,200 for the Trek Emonda SLR 6, with a lot of models at prices in between those two. For the budget-conscious, the Trek 1.1 C road bike is your cheapest option. You get a great road bike that fits someone over 6-ft tall and for a price under $800. As the model number tells you, this is really the entry-level model. However, an entry-level Trek bike is a lot better than your normal entry-level bike, so do not let that scare you away from this model. The bike is light and handles well. Overall, it is a very comfortable ride. For all the features, just click the link below. For sizing, the largest frame for this model is 62 cm. If you need a larger 64 cm size, then you’re cheapest Trek road bike model is the Trek Emonda SL 5. It is more of a high end option that comes packed with features and general awesomeness. This one is another impressive lightweight road bike that is great for tall people. One thing to point out though is that it is not sold with pedals, which is fine since you’ll likely want to get a pair that you prefer anyway. I think you’ll be surprised by what an amazing ride you get from this bike. Granted, it is not easy on the wallet. If you’re not into the Trek bikes above, there are a few other options for tall riders to consider. Check out the links below and see if you can find something that meets your height needs.